A cicada in the process of shedding. In zoology, metamorphosis is the process of pronounced and relatively abrupt developmental change in the internal and external morphology of an animal after the embryonic stage, accompanied by changes in physiology (body functions) and usually (but not always) striking changes in behavior or habitat. Some insects, amphibians, mollusks, crustaceans, echinoderms, and tunicates undergo metamorphosis. In metamorphosis, the immature form can look very different from the adult form (complete metamorphosis) or it can resemble the adult form (incomplete metamorphosis). The transformation from an egg to an adult butterfly involves first a segmented, worm-like larva (caterpillar), then an immobile pupal stage, and finally the winged adult emerges. Likewise, a tadpole, with gills, a fish-like tail, and no legs, metamorphosizes into an adult, airbreathing, legged, and tailless frog. While some crustaceans simply increase in size with each molt, in other crustaceans the larval stage looks so different from the adult that at times the two forms have been erroneously classified as different species. On the other hand, after a grasshopper egg hatches, the emerging nymph looks similar to the adult, but lacks wings and has underdeveloped reproductive organs. The complete metamorphosis of a butterfly has been used as a metaphor for eternal life, as the "earth-bound" caterpillar transforms into the ethereal butterfly. Metamorphosis is an adaptation that contributes to the success of insects and the other organisms. It allows exploitation of different niches, aids in dispersal, eliminates competition between larvae and adults for food and space, and helps in surviving harsh weather (Towle 1989). For example, caterpillars feed on leafy vegetation, while butterflies derive energy from nectar. The fact that caterpillars are specialized for growth and the adult butterflies and moths for dispersal and reproduction, eliminates conflict between two activities that require great energy expenditure (Towle 1989). Scientific usage of the term metamorphosis is exclusive, and is not applied to general aspects of cell growth, including rapid growth spurts. References to "metamorphosis" in mammals is imprecise and only colloquial. There are two main types of metamorphosis in insects, complete metamorphosis and incomplete metamorphosis. Complete metamorphosis, also called holometabolism and complex metamorphosis, is a term applied to those processes in which the larvae differ markedly from the adults. Insects that undergo holometabolism pass through a larval stage, then enter a non-feeding, outwardly inactive state as a pupa, and finally emerge as adults (imago). For example, in the life cycle of a butterfly, the embryo grows within the egg, hatching into the segmented larva (caterpillar), before entering the pupal stage (a butterfly pupa is called a chrysalis), and finally emerging as an adult butterfly imago. The caterpillar looks more like a worm than an adult butterfly, but has the typical insect three pairs of jointed legs as well as several pairs of fleshy legs (Towle 1989). In the immobile pupal stage, an insect may be encased in a protective coating such as a cocoon (rare in butterflies, but common in moths). In the pupal stage, the insect will excrete digestive juices to destroy much of the larva's body, leaving a few cells intact, while groups of cells, called imaginal disks, develop into the tissues of the adult, using the nutrients from the broken down larva. This process of cell death is called histolysis, and cell regrowth histogenesis. Examples of holometabolic insects include beetles, flies, bees, wasps, ants, butterflies, moths, fleas, dobsonflies, and caddisflies. Incomplete metamorphosis, also called hemimetabolism, simple metamorphosis, gradual metamorphosis, or hemimetaboly, is a term applied to those processes in which the larvae resemble the adults somewhat, as they have compound eyes, developed legs and wing stubs visible on the outside, but the juvenile forms are smaller and, if the adult has wings, lack wings. In this mode of development, there are three distinct stages: the egg, nymph, and the adult stage, or imago. These groups go through gradual changes; there is no pupal stage. In hemimetabolism, the development of larva often proceeds in repeated stages of growth and ecdysis (molting); these stages are called instars. The differences between juveniles in different instars are small, often just differences in body proportions and the number of segments. Examples of hemimetabolous insects include grasshoppers, crickets, praying mantids, cockroaches, earwigs, dragonflies, damselflies, aphids, scale insects, true bugs, and cicadas. Whether the insect spends more time in its adult stage or in its juvenile form depends on the species. Notable examples are the mayfly, whose non-eating, adult stage lives for one day, and the cicada, whose juvenile stage live underground for 13 or 17 years. These species have incomplete metamorphosis. Typically, though not exclusively, species in which the adult form outlives the juvenile form undergo complete metamorphosis. Many observations have indicated that cell death plays a considerable role during physiological processes of multicellular organisms, particularly during embryogenesis and metamorphosis. Insect growth and metamorphosis are controlled by hormones synthesized by endocrine glands near the front of the body. Three key hormones are brain hormone, molting hormone (called ecdysone), and juvenile hormone (Towle 1989). Some cells of an insect's brain secrete a hormone that activates thoracic glands, which secrete a second hormone, usually ecdysone (a steroid), that induces metamorphosis. 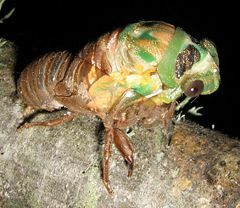 Moreover, the corpora allata produce the juvenile hormone, whose effect is to prevent the development of adult characteristics while allowing ecdysis. Therefore, the insect is subject to a series of molts, controlled by ecdysone, until the production of juvenile hormone ceases and metamorphosis occurs. Pieris rapae pupa, ready to hatch. Amphibian metamorphosis undergoes a single change from larva, called a tadpole, to an adult. In the typical amphibian life cycle, eggs are laid in water. The tadpole then emerges from the egg, and swims freely within the water. The tadpole has gills, a tail, a small circular mouth, and lacks legs. The tadpole will grow, until it begins metamorphosis. Metamorphosis begins with the development of the hind legs, then the front legs. The lungs develop, and the tadpole begins to swim to the surface of the water to breathe. The intestine shortens to accommodate a carnivorous diet, and the eyes migrate rostrally and dorsally. In frogs, the tail is absorbed by the body, for the last stage of metamorphosis. There are many derivations from the typical amphibian life cycle. Some species of salamander do not need to metamorphose to be sexually mature, and will only metamorphose under certain environmental stresses. Many species of frog from the tropics lay their eggs on land, where the tadpoles undergo metamorphosis within the egg. Once they hatch, they are already adults, sometimes possessing a tail which is re-absorbed in a couple of days. As with other arthropods (such as insects), growth in crustaceans, given the hardened exoskeleton, must proceed through series of molts (ecdysis), where the old exoskeleton is shed and a new cuticle is secreted. Molting actually takes after secretion of the new and larger cuticle, but before it is hardened (Russell-Hunter 1969). In some crustaceans, such as crayfish, growth from juvenile to adult involves no dramatic changes, but rather a gradual shift of proportions (Russell-Hunter 1969). However, many crustaceans have changes of form at several molts, which are termed metamorphosis (Russell-Hunter 1969). As some crustaceans undergo metamorphosis, they gain more legs with each ecdysis. For example, the Slipper Lobster transforms from a tiny, transparent, flat, spindly larva existing in the plankton to the heavily plated and brightly colored adult. In the process, the front end with the main limbs, head, and stalked eyes is discarded, while the posterior portion is developed into the adult. Prawns (shrimp-like crustaceans) undergo metamorphosis through four main larval stages: nauplii, zoea, mysis, and post-larvae (Dixon and Roberts 2006). The length of the larval stages depends on water temperature and food availability (Dixon and Roberts 2006). Davies, R. G., and A. D. Imms. 1988. Outlines of entomology. London: Chapman and Hall. ISBN 0412266709. Dixon, S. C., and S. D. Roberts. 2006. West Coast Prawn (Melicertus latisculcatus) fishery. Fishery Assessment Report to PIRSA Fisheries, SARDI Aquatic Sciences Publication No. RD03/0076-4. Towle, A. 1989. Modern Biology. Austin, TX: Holt, Rinehart and Winston. ISBN 0030139198. This page was last modified on 19 September 2018, at 15:41.